West Irvine Intermediate won the attendance banner for the 7th month of school. Congratulations to students and staff. Pictured above are WI students Rebecca Brooks, Kadara Skinner, and Carisma Carrier. Estill Springs Elementary won the attendance banner for the 6th month! Pictured are students with perfect attendance. These students have not missed one minute of instructional time so far this year. Great Job! 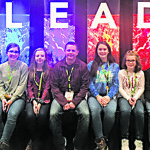 Bryndan Brinegar, Emmaleigh Dennis, Jeremiah Guinn, Kenlee Horn, Hugh Lawson, Mason Raider, Chandler Snowden, Travas Stevens, and Tayden Sykes.